Are internet service providers becoming too powerful? Advocates of an unfettered internet are fighting to restore Obama-era regulations requiring Comcast, Verizon, AT&T and other internet service providers (ISPs) to treat all internet traffic equally in terms of speed, access and cost. 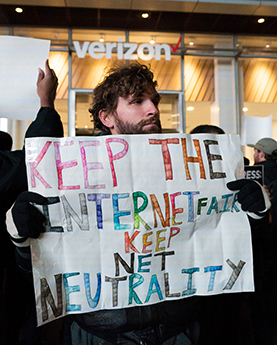 The so-called net neutrality rules, instituted in 2015 when Democrats controlled the Federal Communications Commission (FCC), were repealed in December 2017 after Republicans regained control of the agency. The FCC is led by former telecommunications lawyer Ajit Pai, a free-market champion of deregulation who has criticized the net neutrality rules as burdensome and unnecessary. More than 20 states are suing to preserve net neutrality, arguing that federal regulations are needed to keep the large ISPs from becoming too powerful. But defenders of the FCC vote say net neutrality harms the ability of the ISPs to improve their networks and ultimately hurts consumers and businesses. The European Union, meanwhile, has passed laws protecting net neutrality and labeled equal access to the internet a basic right.